Terminator 2: Judgment Day is currently back in theaters with a beautiful 4k resolution 3D conversion and moviegoers have been giving it rave reviews and director James Cameron has been out doing some press to promote the re-release. While simultaneously tearing down this summer's blockbuster Wonder Woman, Cameron also took time to share stories about the making of the sequel to Terminator, including the fact that lead actor, Arnold Schwarzenegger, initially hated the script. Screenwriter William Wisher recently made comments that the script that he and Cameron wrote was "surprisingly easy to write." While speaking to The Guardian, Cameron brought up the fact that Schwarzenegger tried to originally talk the director out of making Terminator 2: Judgment Day, the action movie that became an iconic box office success upon its release in the summer of 1991. Cameron explains. "Arnold HATED it, he even tried to talk me out of it! But I said: 'No, this is what we're doing, it's really cool.' And along the way, he saw the wisdom of it,"
Though Schwarzenegger initially hated the script and the idea of the movie as a whole, his hefty paycheck probably helped soften the blow. The actor earned a whooping $15 million dollars for 700 words of dialogue, which comes out to $21,429 a word. Screenwriter William Wisher recently sat down with The Hollywood Reporter to promote and celebrate Terminator 2's new theatrical release. Wisher revealed that he and James Cameron wrote the screenplay together in one room of Cameron's house, using only one computer. The two then split off to work on the script separately, to flesh it out. All in all, Wisher says that process was rather painless, even going to say that it was easy. Wisher said that the 7 years in between the two movies gave he and Cameron a lot of time to go over the "what ifs," which led to a surprisingly streamlined writing approach for the duo. Terminator 2 was the summer blockbuster in 1991 and actually did better its second weekend than it did during its debut. Word of mouth and news about the action movie being the most expensive movie ever made (at that point) started to bring in the money at the box office. The movie ended up grossing $519 million worldwide and has become a benchmark of sorts for the action movie genre. Arnold's star began to shine even brighter after the release and surely made it possible for him to smoke white cigars on the set of Batman and Robin. Another factor that helped get people in the theater was the pairing with Guns N' Roses for the soundtrack. Guns N' Roses, then arguably the biggest band on the planet, allowed Schwarzenegger to listen to their in-process mixes of the then unreleased Use Your Illusion double album and choose a song for the soundtrack. He chose "You Could Be Mine," which became a massive hit on radio and MTV. The video featured scenes from the movie spliced in with the band playing and even had Schwarzenegger make a cameo in the video as the Terminator to come terminate the band. 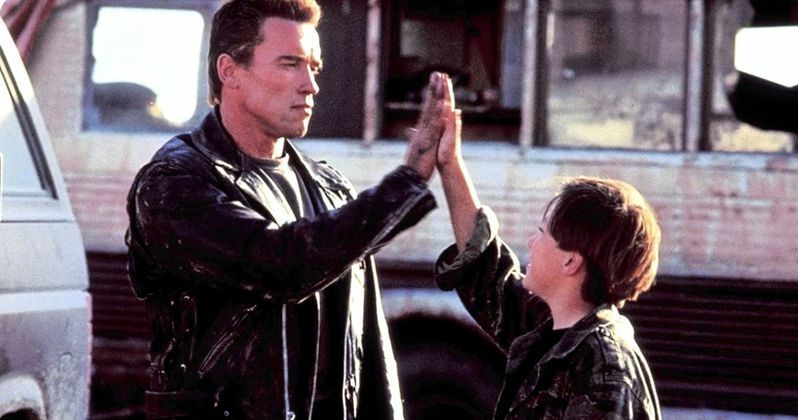 So, the easy to write script that Arnold Schwarzenegger originally hated is still being talked about today and revered as a killer cyborg classic. The 3D 4k conversion is now in select AMC theaters, so make sure you go check it out while it's still available on the big screen. IN the meantime, check out the trailer for Terminator 2 3D below.